L&T Technology Services Ltd. - Winner of the Golden Peacock National Quality Award! We are happy and proud to share this great moment with all of you!!! One of our earliest and esteemed clients, L & T Technology Services Ltd., CMMI DEV ML5 Organization has been awarded the Golden Peacock National Quality Award 2017. It is the most prestigious award given to technology companies for its best in class engineering services and solutions. L&T was selected after a three tier assessment process, among 241 other companies, finally shortlisted from over 400 companies that applied. We have been working with L&T Technology in their process improvement/CMMI journey since 2002, and it is this kind of a great moment that makes us humble and privileged to work with such "cultures of excellence". Congrats LTTS! We are thrilled to announce that L&T Technology Services Ltd (LTTS) has been awarded the Golden Peacock National Quality Award 2017 beating all other technology companies for its best in class engineering services and solutions. L&T Technology Services was named as the winner of the National Quality Award by the Golden Peacock Awards Secretariat in recognition of it's consistent focus in enabling cutting edge technologies for global businesses. 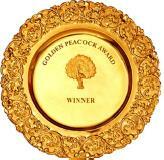 Golden Peacock Awards were founded by the Institute of Directors, India in 1991 and are globally regarded as a benchmark of corporate excellence. The National Quality Award Scheme was instituted to encourage total quality improvements in both manufacturing and service to our organizations in India. The Golden Peacock Institute of Directors (IOD) conducted an exhaustive review of all applicants' Quality Management Systems across various criteria such as best practices implemented, product and services development process, customer satisfaction scores, audit mechanisms and corporate governance structure among others. We came out on top across all these criteria. This is a delightful testament to the high quality and complex engineering services and solutions that LTTS delivers to its global clientele across the ER&D spectrum and also a reflection of our operational excellence resulting in high customer satisfaction. L&T Technology Services will be formally conferred with the award at a specially organized 'Golden Peacock Awards Ceremony', in the presence of a distinguished gathering of business leaders during the Institute of Directors (IOD) India's 27th World Congress on Business Excellence & Innovation on the 19th April 2017 in Dubai. The award will be presented by Sultan bin Saeed Al Mansouri, Hon'ble Cabinet Member and Minister of Economy, Govt. of UAE. This year, the Awards Secretariat received around 400 responses, out of which, after careful scrutiny, 241 applications were shortlisted for final selection through a 3 tier Assessment Process. Justice (Dr.) Arijit Pasayat, former Judge, Supreme Court of India, headed the Awards Jury this year.